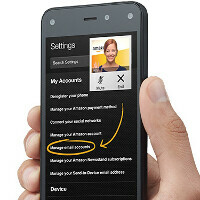 We've asked for it, and the Amazon phone is now a fact. The Fire Phone, as it is called, has just been announced, and by the looks of it, most of our expectations for what the phone is going to be have been pretty accurate. For starters, the Fire Phone is not a specs monster, such as the competing flagships from other brands. Rather, it comes with a specs sheet that's a bit more modest, with items like a 4.7" 720p screen and a Snapdragon 800 SoC in the mix. While we've already taken a good look at most of the phone's aspects, one thing that we're yet to see is how big Amazon's latest creation is compared to its rivals. Don't be surprised from the fact that we're comparing the Fire Phone to super-phones like the iPhone 5s, One (M8) and Xperia Z2. The Fire Phone is offered through AT&T, starting at $199 with a two-year contract, or at the mind-boggling $650 off contract, which puts it in the same league as the industry's leading handsets. Let's see how the Amazon Fire Phone fares in the dimensions department! True, but it does not feature 4 infra-red cameras and these need some space. yeah yeah enough about the flame phone... Can anyone help me, my Galaxy Ace keeps corrupting photos, videos and music in my SD card. Perfect for one hand usage. Go Amazon!!!! I guess more competition is good, but geez do we need another Android-based OS? They would have hit the mark at $99 on contract. I can't see this going anywhere, particularly when many of the features and specs have already been done. Fire Fly is just Bing Vision which has been on Windows Phone for a while. Ditto regarding the camera button. Being exclusive to a carrier is a big face palm. Just ask Nokia and Microsoft how that has worked out for them for the first 18 months of WP8. The ONLY enticing element of this phone that I read was the unlimited cloud storage for photos. Of course, Amazon will data mine them all but it's still nice. The camera tech on the fire phone hasn't been on any other phone. Something like firefly has been on all smart phones for a while now. QR codes, barcodes, image scanning. Although Amazon has packaged it nicely and it has a number of tricks not found on WP. The unlimited cloud is good, but I really like the Amazon prime for videos and movies, as well as access to over 20 million songs. Just access to the movies and music alone is worth the $199. Last I heard it was 1M songs, not 20M songs. Someone out their will buy it.. wont be many. It's almost as big as a GS5. but with a screen almost a half inch smaller. it's a 720p screen vs a 1080p. has a slower chipset and no SD card. Oh, and it doesn't even support the play store. No thanks!